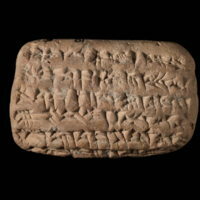 This clay tablet, the Babylonian Chronicle for the years 605–594 BCE, records events from the twenty-first and final year of the Babylonian king Nabopolassar’s reign and the first twelve years of king Nebuchadnezzar’s reign. The text describes king Nebuchadnezzar’s invasion of Jerusalem, including his capture and exile of king Jehoiachin. The text reads: “In the seventh year, the month of Kislev, the king of Babylon mustered his army and marched to Ḫatti-land (=the Levant). He encamped against the city of Judah and on the second day of Adar he took the city and captured the king. He appointed a king of his own choice there, received its heavy tribute and sent (them) to Babylon.” Nebuchadnezzar invaded because king Jehoiachim (Jehoiachin’s father) had rebelled against him, refusing to send tribute (2 Kings 24:1). Jehoiachim, however, died shortly before or during the siege. He was replaced by his son Jehoiachin who, at the tender age of 18, found himself on the receiving end of Babylonian wrath. Nebuchadnezzar deported Jehoiachin and other members of the royal family and some of the elites of Jerusalem—warriors, priests, artisans, and officials—into exile in Babylon (2 Kings 24:14–16), and placed Zedekiah (Jehoiachin’s uncle) on the throne instead (which indicates that not all of the elite was exiled). The tablet does not say what “heavy tribute” Nebuchadnezzar received, but 2 Kings 24:13 reports that he took all the gold, vessels, and treasures of the Jerusalem temple. 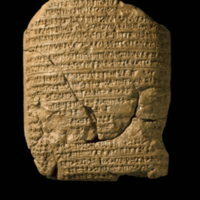 The Babylonian Chronicle constitutes an extra-biblical witness to events reported by the biblical text and, in this instance, this evidence corroborates the basic version of events in the Bible. This agreement means that three things may be considered very likely to be historical. First, Jerusalem was invaded but not destroyed in 597 BCE. Second, a king of Jerusalem (Jehoiachin) was deported to exile in Babylon (see also Weidner's ration list). Third, Nebuchadnezzar replaced Jehoiachin with a king of his own choosing—the Bible gives the name Zedekiah. From this point on, Jerusalem's and Judah’s fate were firmly intertwined with that of Babylon. In hindsight, the state and the city had little more than a decade to stand.